Hey there guys. As promised, because the Shadowverse post got a lot of views, I am going to make it a regular thing (probably). Today I'll be going through the new expansion, Tempest of the Gods and talk about some of the cards that I got from the expansion packs. As you know, there are 7 factions so I'll be doing separate reviews on each factions. So be patient please. Starting this off is Gawain of the Round Table. No this is not Albert, Levin Saber. 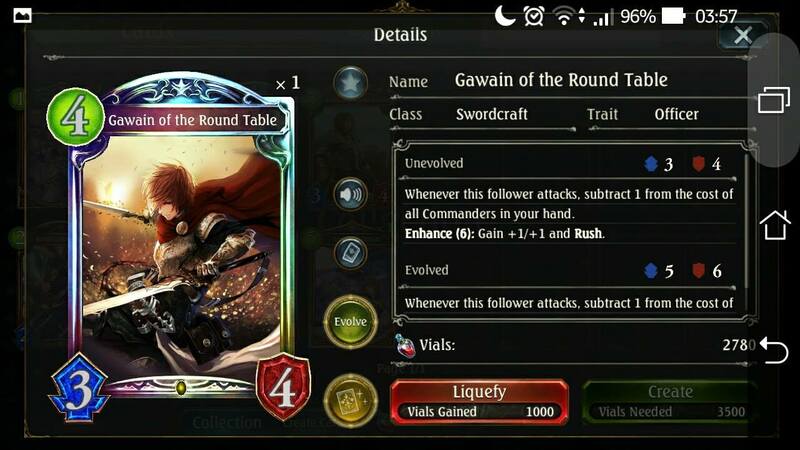 Gawain is a Legendary rarity and a pretty well-balanced one at that as well. As you know, a lot of them commander cards are kind of costly so he's your go-to for reducing their costs. Ignore those borders. My phone... is kind of a failure at taking screenshots. Though for him to be useful you have to attack so he's not going to be useful early. You either evolve him or play him for a 6 cost. Don't risk leaving him there on the field not attacking anything for a turn. This will benefit you the most if you're building a commander deck. No this isn't a joke. A commander-only deck is definitely viable since the introduction of the Tempest expansion. 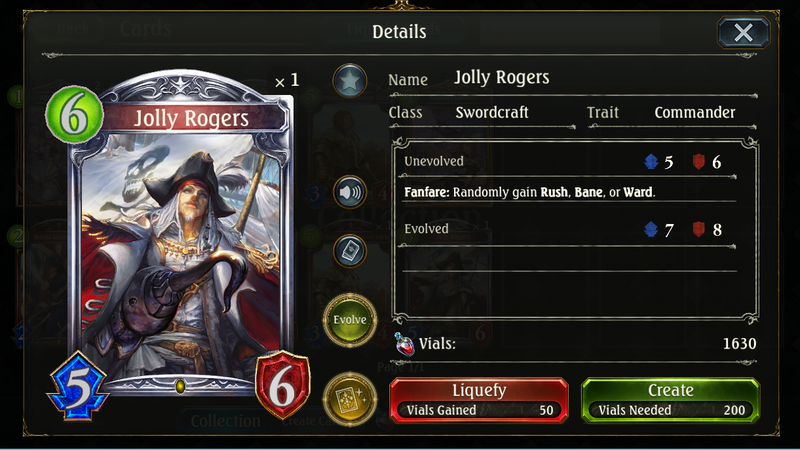 There are a lot other useful cards that support commanders that are not... of Legendary rarity. So don't worry if you don't get this guy. Moving on to more craftable cards, here we have the Luminous Mage and the Luminous Standard. 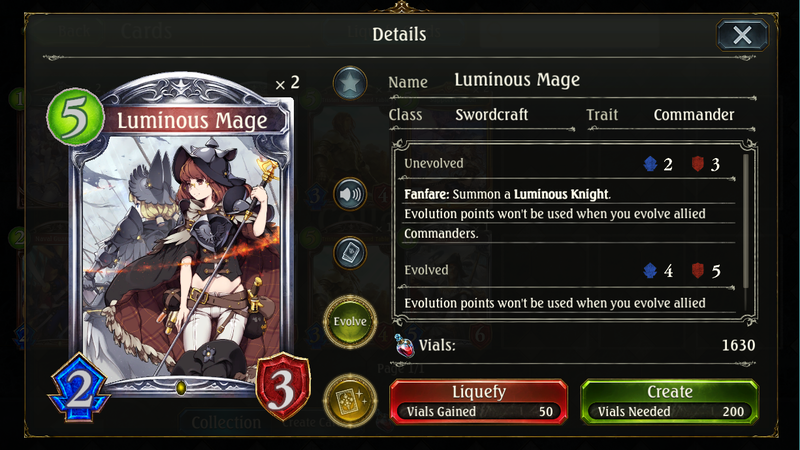 As you can see, the Luminous Mage is another awesome card if you're going full commanders. 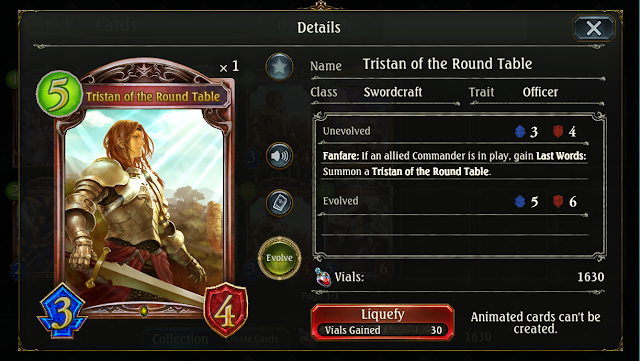 Its similar to Titania's Sanctuary from Forestcraft but with commanders. You can immediately rush a commander as long as this card is on the field and save on a lot of evolution points this way. Read it. 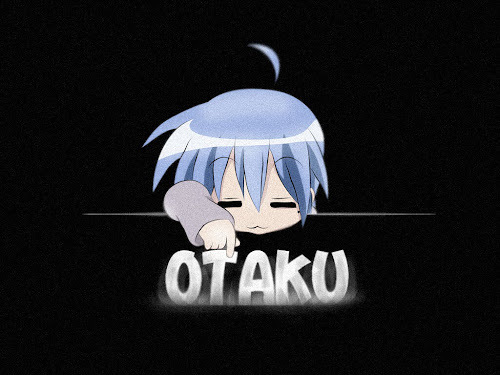 That's just too awesome isn't it? Its crazy good. The only drawback to this card is that it's a 5-cost and its not an amulet. It means it can die easily. You'd have to have something else backing her up. 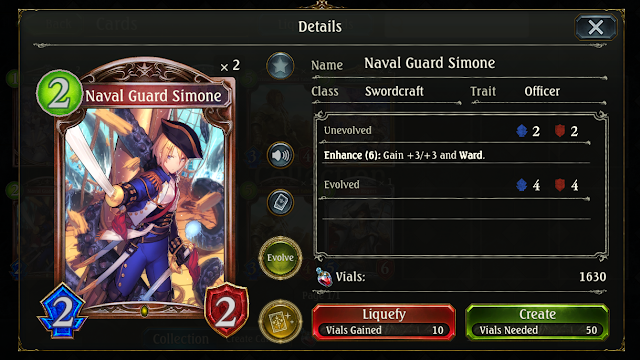 Say a Captain Lecia to protect her from spells or wards to divert the enemy's attention. Other than that, this is just a very stellar commander support. Oh and need I not remind you the Luminous Knight she summons is also a commander that has great synergy with her. Unlike a certain card that summons Megalorcas. This is another support for commanders and its sort of an improved version of its officer counterpart, the Royal Banner. That's because the Royal Banner costs 4 to play and it only gives +1/0. 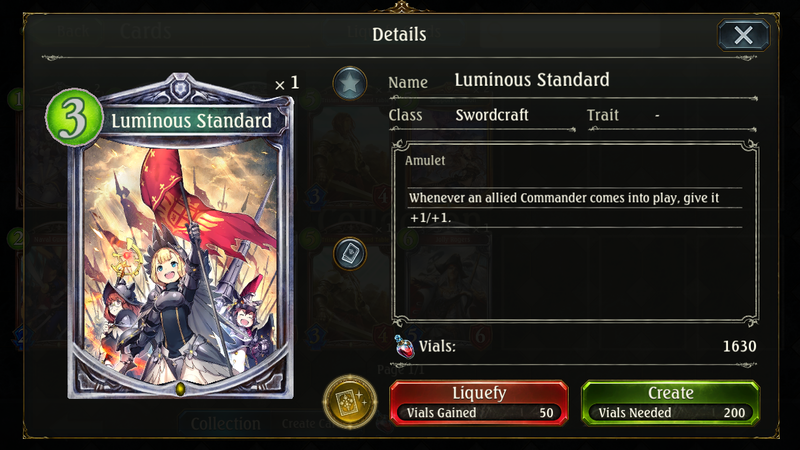 The catch is that Luminous Standard only gives a boost to cards "coming into play". This means that cards already on the field will not get a boost. Keep that in mind. Now these last two cards aren't exactly what I'd call essential but they have "commander" in their description so they're somewhat useful anyways. Support Cannon has quite the effect. It deals damage as much as a commander being played that turn. This gives another extra edge to those high-cost commanders that have high attack values as they can fire off an extra attack to any and all monsters on the field. Be it an "ambush" monster or an "effect/spell resistant" monster as its under the "random" clause. If there aren't any monsters on the field, it damages the leader instead. Sounds scary doesn't it? I guess that's why you need to pay a 5-cost to play it. Goodbye aggro, hello control. Now this. This card. By no means do I deem this card necessary for the creation of a solid commander deck but you will have fun anyways if you like to gamble on your luck. Its a rather cheap card for its stats because of those random buff it gains but other than that, I have no idea why you'd want to push your luck with this. But it'll definitely be fun anyways. Now that the major supports are out of the way. Here are some other cards I pulled out and tested. Tristan is like a mini Mordecai. His effect sounds good on paper but in actuality it isn't. You need to have a commander on the field before summoning him. His effect only activates once because if he revives, it doesn't activate his Fanfare effect again. 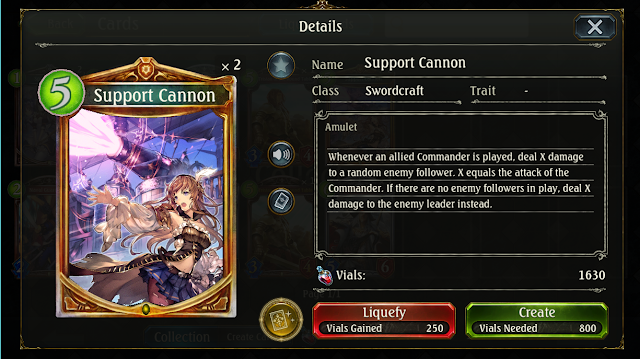 Second of all, the effect clearly said "allied commander" but it doesn't mean that. It means that you have to have an allied follower with a commander trait on the field. An amulet doesn't count. I tried. Simone is drawn beautifully yet... I can't stress how I hate high attack stat wards. He's useful to have around but I'd only ever use him for his initial 2-cost. Another card that I think would be dangerous for swordcraft. This card is similar to Golden Dragon's Den but slightly more viable I guess? It doesn't stay on the field too long and it will be incredibly helpful when you're trying to mill your hand or when you have no cards in your hand. Yes even if you don't have any card to discard, the draw effect still activates. It has Bane and Ambush. What more can I say? OKAY IF YOU GOT TO THIS POINT, STOP. READ THIS ONE. Ahem. 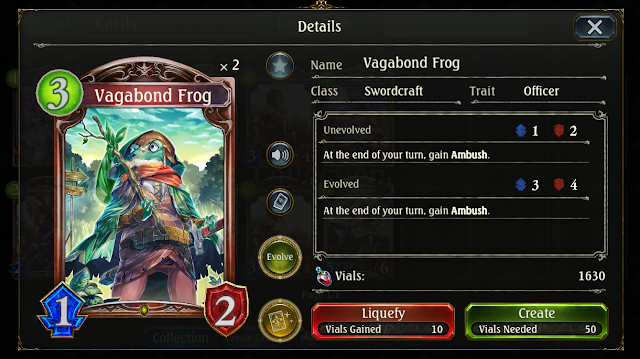 Vagabond Frog looks like a stupid ridiculous 3-cost bronze card but if it was up to me I'd make this a Legendary rarity card. If you look at this card carefully, it GAINS Ambush every time you end your turn. Means it will never die as long as there are no area spells or "random" clause effects and hits your opponent constantly every single turn without worry. Now you might say "eh its just 1/2 that's not even scary". 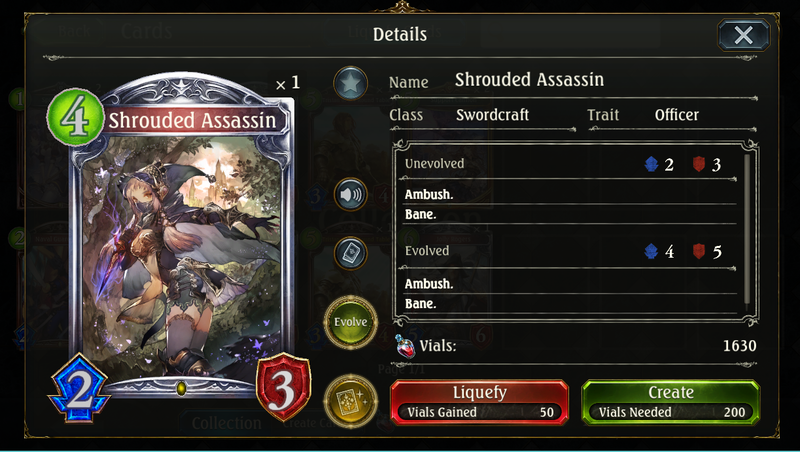 Swordcraft lives on buff cards, man. Royal Banner, Forge Weaponry, Rogue's Creed. Just to name a few, that is. All these cards will spell your doom the moment it buffs this card here. The moment you lose your wards and your area effects, get ready for a round of beating. 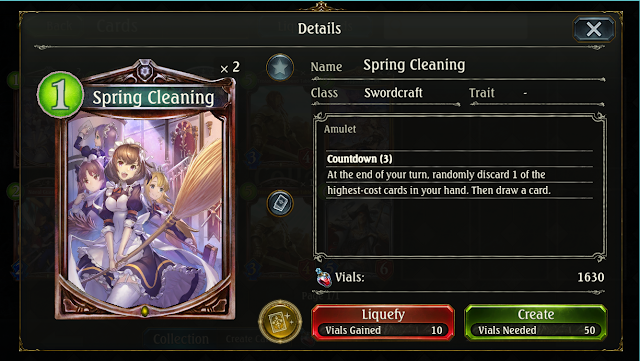 That's it for Swordcraft I guess? A lot of Commander support cards and one killer Officer card. I'll start reviewing other cards as I play test them and if you're wondering whether I'll ever start reviewing anime again. I'm taking a little break from that. Oh and if you have any thoughts on the cards or any tips you'd like to share, feel free. Or if you'd like, come give me a beating. Holler me down at the comments and I'll give you my ID and be your punching bag.